I hope you're all doing well in shaa Allah. I have another planner/journal for you. 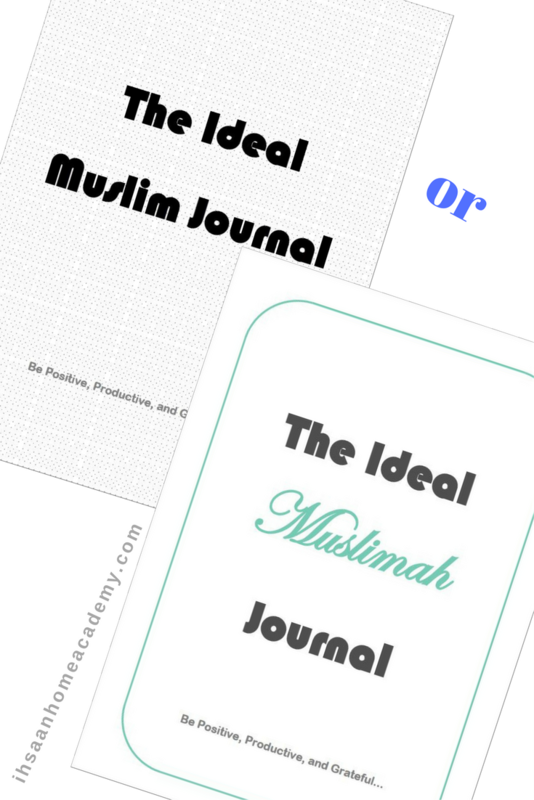 This time, it's a full journal for both Muslim men and women. I believe we need to make planning and productivity an essential part of our lives. Some people use technology to do so, but there are still many people who prefer writing on paper. Wheven I try journaling using apps or software, I always find myself back with a pen and paper. 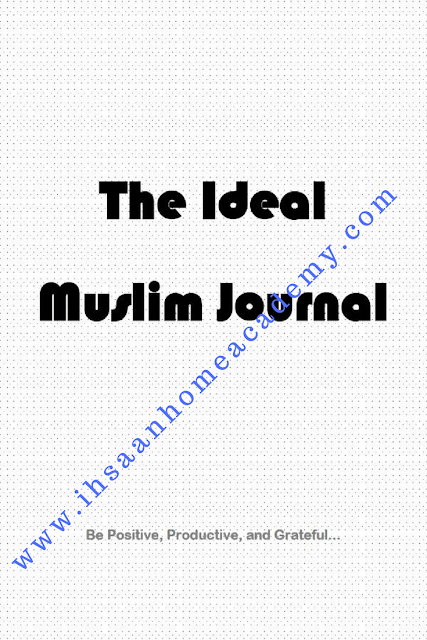 So, here it is; a nice and complete journal for Muslims who want to be productive. Planning is important for everyone; especially parents! It becomes more crucial when parenting comes along with being an educator, and... an entrepreneur. One person can only take on all these hats with extra planning or journaling. Journaling helps in having something to look back and see what was done right or wrong, and what needs to change. I find myself much more productive everytime I plan and write in a journal. There are two covers in this journal; one for the Muslim, and the other for the Muslimah. Let me give you more details. I hope you'll like it and find it useful. If you have any questions, feel free to contact me in shaa Allah. Planning is a very important aspect of productivity. As human beings, we easily forget, lose focus, and are quick to find ourselves doing little to nothing when we don't plan our day. There's so much that could be done in a day if only we manage to maximize it. People who accomplish multiple projects aren't any different from those who don't. It's all about planning. 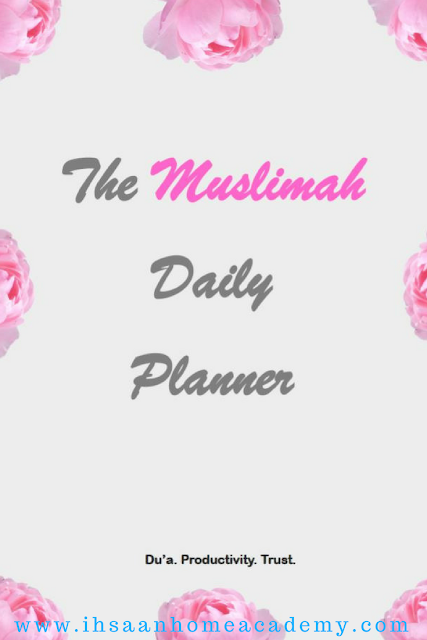 The Muslimah Daily Planner makes it easy for Muslim women to plan their day and stay productive. To buy this planner, click here. Learning Arabic is not a requirement, but it's a very useful language to learn if you're Muslim. Although there are translated books of the Qur'an, hadith books, and other books of knowledge, we should all know that translation never does complete justice to languages in general. When it comes to the Qur'an, it gets even trickier. The meaning of the Qur'an can for sure be translated, but it's impossible to translate the Qur'an along with all that comes with it (i.e. the deep meanings, the choice of words, the patterns, the rhyming, and more). 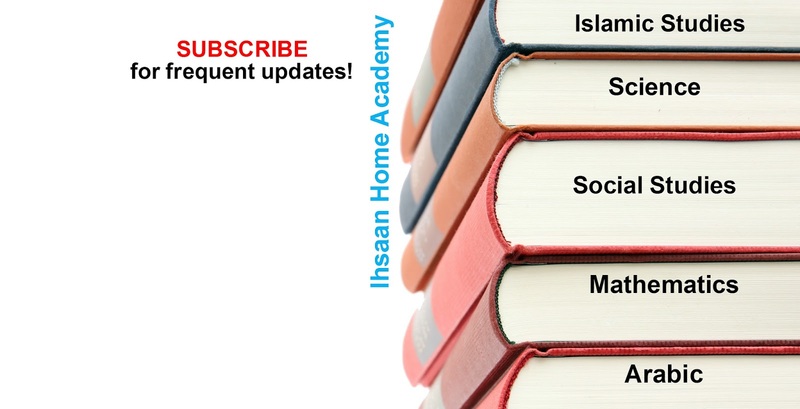 There are Tafseer books (explanation of the Qur'an) that we use (translated or in Arabic) to help us understand the Qur'an as it should be understood. But, it's also important to directly understand it while listening, without always opening books. Listening to the Qur'an should be a daily happening for every Muslim. 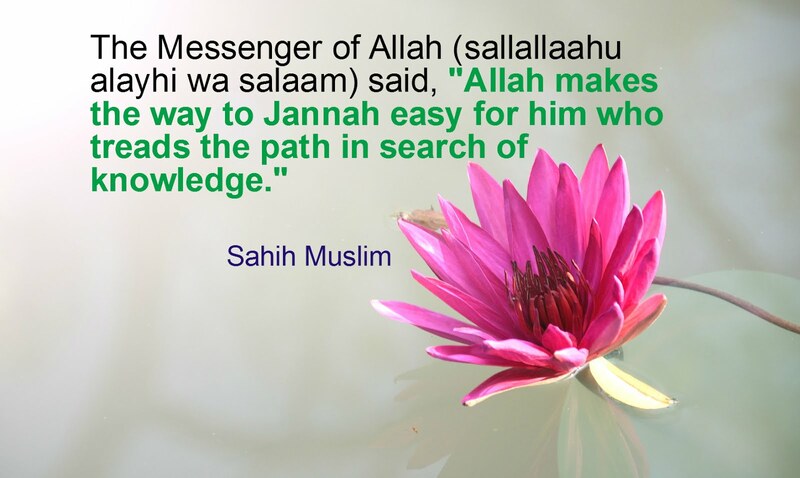 It helps us boost our eemaan (faith) and hopefully gets us closer to Allah. It becomes sweeter when one understands while listening. Try this by learning the meaning (word by word) of a short Surah, then read the Tafseer to have a complete understanding of the Surah. After mastering it, listen to that Surah without translation or recite it in your daily Salah. You'd be amazed at how much focused you could get. I tried this with some Suwar (Surahs) and felt a level of sweetness I had never felt before. 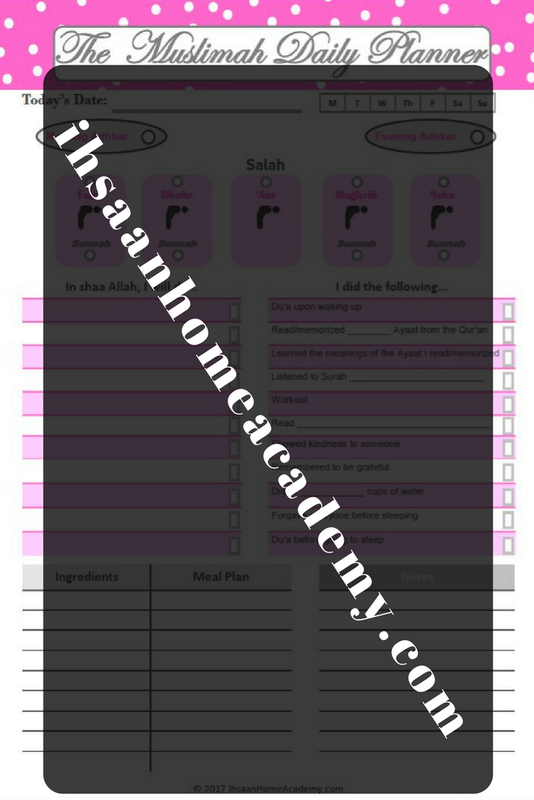 Doing this may encourage you to learn Arabic (Fus-ha; Arabic of the Qur'an). It may take you much longer to learn the whole Qur'an word by word. The easiest and shorter cut may just be to learn the language. Of course, the above experiment isn't only limited to non-Arabic speakers; I'm speaking to Muslims in general. Understanding the language along with the Tafseer should always come together. One who speaks Arabic should read the Tafseer, and the one who doesn't speak Arabic should try to learn it and read the Tafseer as well in shaa Allah. If you've tried or decide to try the above 'experiment,' please let me know how it went. You probably know that there are many dialects and versions of Arabic. When learning Arabic for the Qur'an, try learning Fus-ha Arabic. It is a more classical, rich, and original version of Arabic. If you learn Fus-ha, understanding the Qur'an should be easier in shaa Allah. Please, don't wait till your children are grown to introduce Arabic to them. It's easier to learn a language when the brain is young and fresh. Do them a favor and expose them to the language while they are young. You'd be amazed at how much they could absorb. Also, don't make it as basic as knowing few names of animals and food items as it's usually done in most Islamic schools and homeschools. 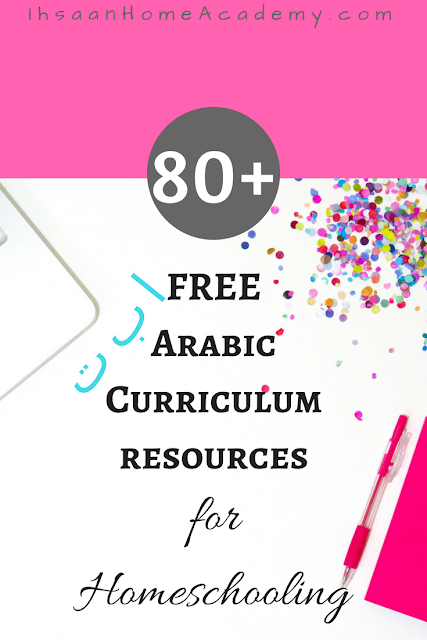 There are more than enough FREE resources online to help you help your children learn Arabic fluently. 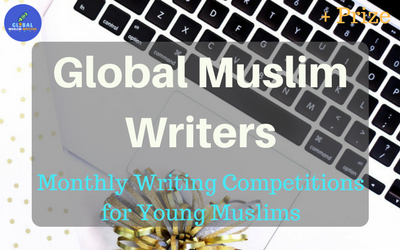 They could also practice with each other, watch Islamic Arabic cartoons sometimes, and/or listen to Arabic audios to help them master the language. 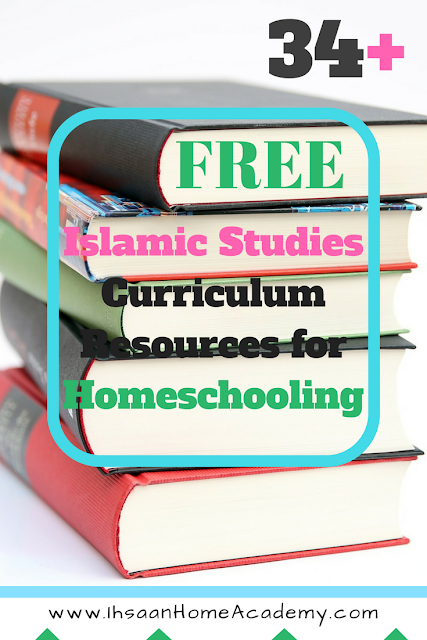 Now, let's get into the list of free Arabic curriculum resources that you could use for yourself and/or for your homeschooled children in shaa Allah. Note: Download the files you find useful as soon as possible because they may not be available all the time. Sometimes, file locations change if edited, so the links also change. There ya have it; more than eighty resources to learn Arabic. Now it's only a matter of willingness, discipline, and action. If you thought that the only or easiest way to learn a language was to just live in a country where the language is spoken (as I thought), it's time to change that mentality. Thinking like that only puts obstacles on your journey. Do it at least for your children who have fresh brains ready to observe new information. Imagine your children not always needing translation every time they listen to the Qur'an. Right; you get the point. May Allah make it beneficial for us all. Yep! 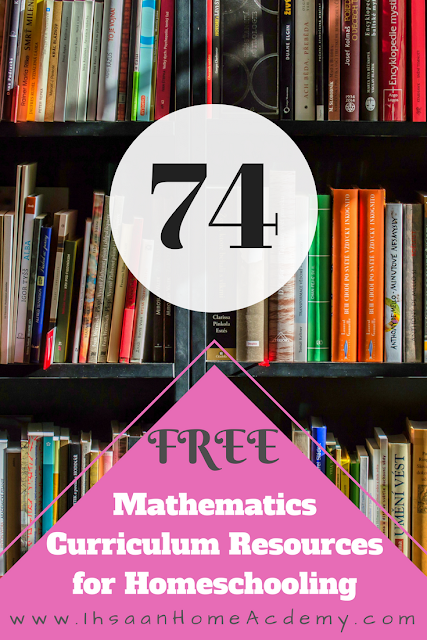 Another list of free resources; this time, it's Mathematics! If you're planning on buying Mathematic textbooks and workbooks for your homeschooling, why not first check these free resources out? 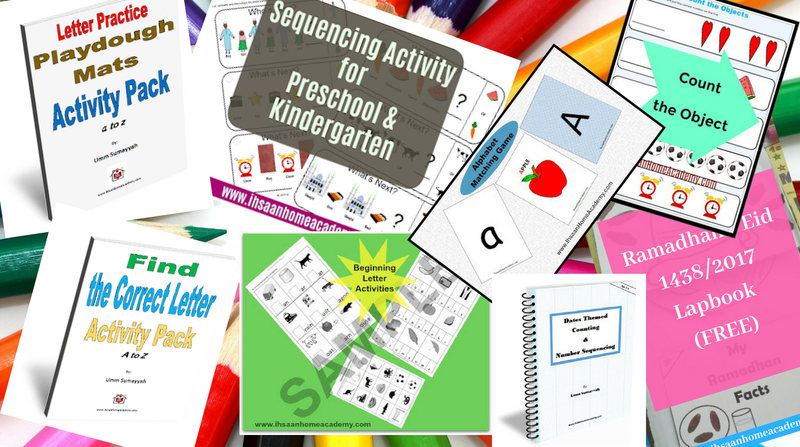 You may end up using them as primary curriculums or as supplementary resources. Besides, they are real textbooks used in some traditional classrooms. The only difference is that they are PDF files instead of hardcopy. 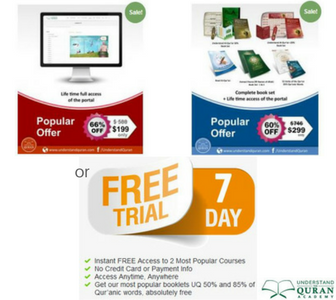 If you don't mind printing out papers, well, there ya have it; free books! To be honest, you don't even have to print out all pages. 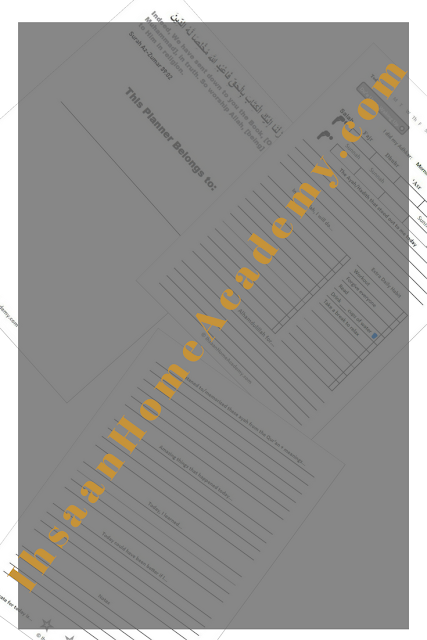 Just print whatever you need for each week of your homeschooling days. 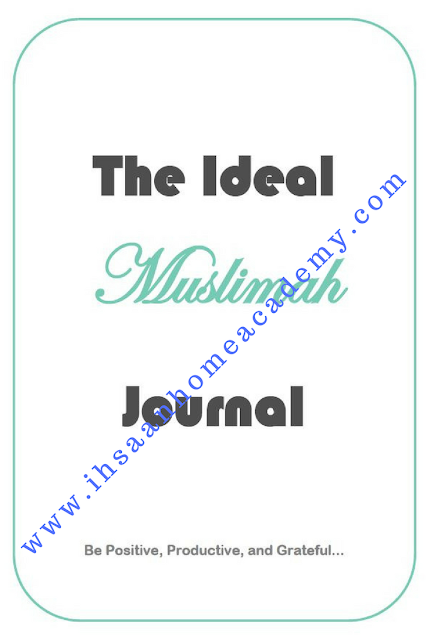 These resources include arithmetic, Algebra, Geometry, Trigonometry, and more. Let's get to the resources! Note: Download whatever needs to be downloaded as soon as possible while the links are working. I had to take out some of the links because they no longer worked. I do have the PDF files, but I wasn't given the permission to share them, so I only share links. Hurry; download them! If you use any of these resources and find them useful, I would love to hear your experience. Message me and let me know how it went. 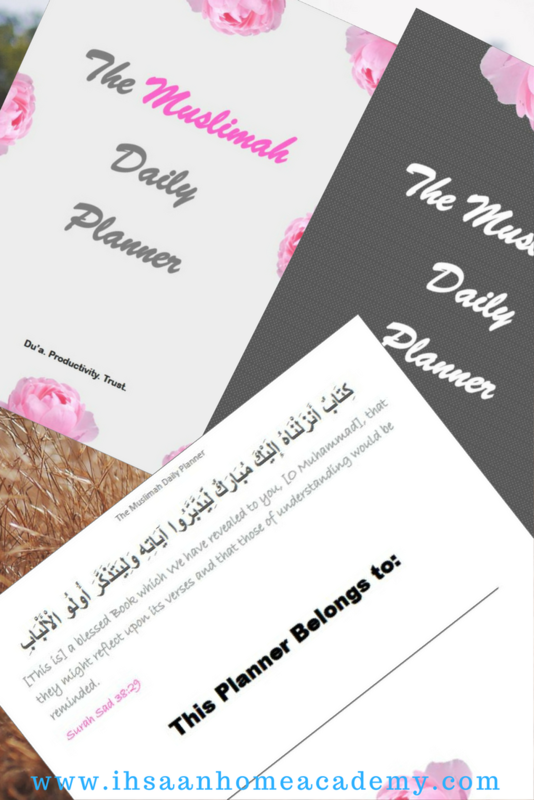 Don't forget to check back for more resources in shaa Allah. 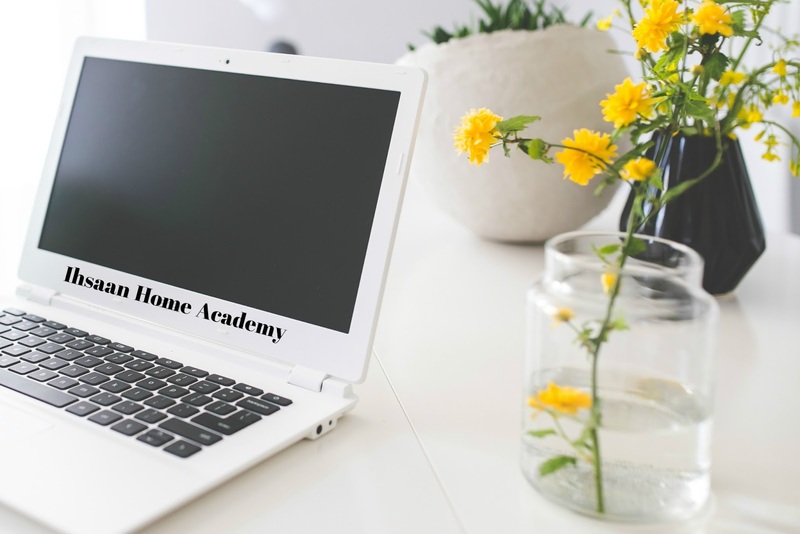 Many homeschooling parents wonder whether they should start homeschooling their preschooler. There isn't a right or wrong answer to this, but there could be different options for each child. Every child learns differently and has different interests. The average preschool age is between 3-5, but less than 3 is a also preschool. 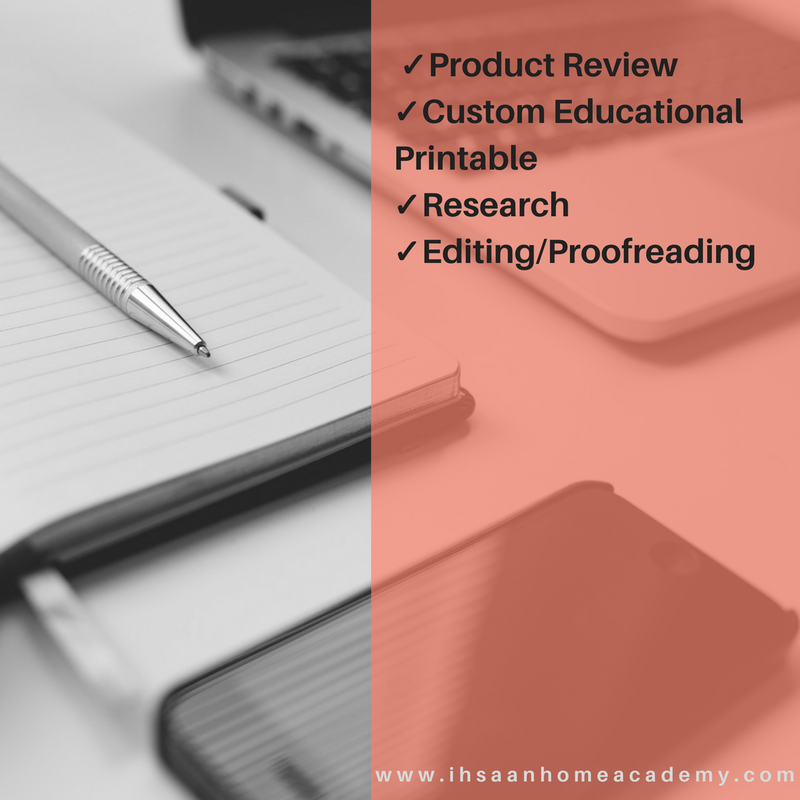 I talked about whether it's necessary to homeschool preschool in a previous post. The post also comes with a preschool assessment sheet for Muslim kids. Ultimately, parents should stick to what's best for their children. Even though there really isn't one way to answer this question, it's still nice to see different perspectives and probably take tips or inspirations from them. Let me share with you what I've been doing with my daughter. From the time she was a newborn, I enjoyed reading books to my daughter. She loved it! I was sometimes amazed by how concentrated she was and how much interest she showed. Through books, I believe she learned most of what she knows today. I was never afraid to read 'advanced' non-fiction books! I believe her learning grew from there. Everything we read had something new to learn from it. To get her attention, I made it as fun and silly (sometimes) as I could. The things parenting would make someone do! You gotta do what you gotta do. To make the more 'complexed' books easier for her to understand, I pause a lot throughout our reading times. I ask her questions and answer my own questions by saying something like, "Where do elephants live? They live in the Savannah, right?" I also ask her questions I think she may already know or questions that she could guess based on the available information. It stimulates her brain and encourages her curiosity. This made her love asking questions. Oh, by the way, I always elaborate on new words. We even watch videos when we learn about new animals or objects. She loves when we do that! Overtime, I saw her love for books grow stronger and stronger. Today, if all she could do was read books all day, she would be over the moon! I even started a challenge few months ago to read her at least 10 books a day. I remember some people wondering on Twitter how I did it and what kind of books I read to her. It went very well for some time and we both enjoyed it. I think I just burned out eventually. Guess what... 10 books were NOT enough for her! Allahumma baarik 'alayki (may Allah bless her). She cried every time the reading came to an end. I just couldn't keep up with it, but I really wish I could do that ago. Maybe not ten books, but a little less may be okay too. These are just some examples. As you can see, some of the books are word-picture books. They are usually animal, insect, object, opposite, and first word books. She learned many words through these books. She could name most of the animals and objects before the age of 3. Another thing I do is that I incorporate Islam when we read. An example would be while reading about animals, we talk about who created animals, the amazing things they do, and how the creation of Allah is amazing; Subhaanallah (Glory be to Allah). I buy some of the books and we borough some from the library. We do also read some kid fictional books with meanings. As much as I like to be patient with her learning to read, I feel the pressure to just teach her now because she's ready. She wants to read on her own and even pretends to be reading sometimes. We started with letters, then moved up to blending the letters to make sounds. We later started reading small words, and the plan is to move on to blending more words and learning sight words in shaa Allah. We're currently on blending small words. 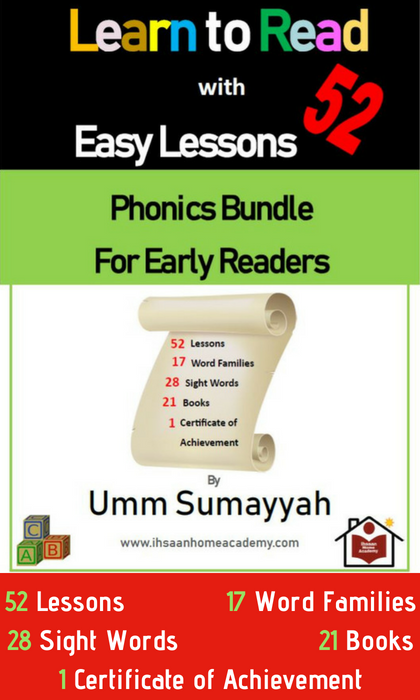 I'm planning on soon making an A-Z phonics booklet for beginners in shaa Allah. I think that will help me stay focused a bit more. I'm currently not as focused and consistent as I should. I like everything structured or else I lose my focus. My daughter LOVES asking questions. She always wants to know what something is, the purpose of it, what it does, and what people do with it. She loves details and hates being clueless. When she doesn't know, she asks! And she won't stop asking until she gets an answer. Sometimes I don't know the answer. I happily tell her "I don't know." What I do to follow up the "I don't know" is by letting her know that we can find out in shaa Allah. So, we go on the Internet and start researching. I read what needs to be read and explain it to her, get a video for us to watch, and we talk about it. When she learns something new, you better believe she will mention it a million time. Well.. not literally a million time, but... you get the point! She started playing alone since she was a little toddler. It helped her grow her imagination and find new skills on her own. I talked about independent play in a previous post. She learned to draw, color, mold, and perfect her fine motor skills by herself! She would wake up in the morning, take her pen and notebook, and start drawing whatever she wants. She also loves painting. She may not be perfect at it all, but she learned it all on her own before the age of 3. Let your kids explore on their own! It helps them develop and help you find time to work on different things. My husband and I always encourage her in what she does. Whenever she makes something new, she runs to us to have a look. She really enjoys making things on her own. As you can see, her drawings have faces. From the beginning, I tried talking to her about no-faces, but since she taught herself to draw by observation, she tries to draw things as she sees them. Whenever I draw without a face, she tells me, "Where are the eyes? Where's the mouth," or whatever else. In shaa Allah she'll eventually understand. I've always talked to my daughter as I talk to someone much older. The baby language thing; nah, we don't do that. Because of that, when she talks, she sounds like a child much older than her age. She's really quiet when she goes outside, but she's far from quiet at home. She loves playing, but also loves "grown-up-ish conversations." She likes pretending to be a woman and mother sometimes and it's cute because she obviously knows she's a kid. The important part of it all is that we have fun while we're at it. I need to improve on this one. She always likes to help around when I'm cleaning, cooking, washing clothes, or doing any domestic chores. I lose patience and just want to do it all. I'm working on this. I really should let her help out more. She loves it, and it helps her learn more. You don't have to do this one, but if you choose to, there are many free printables online. 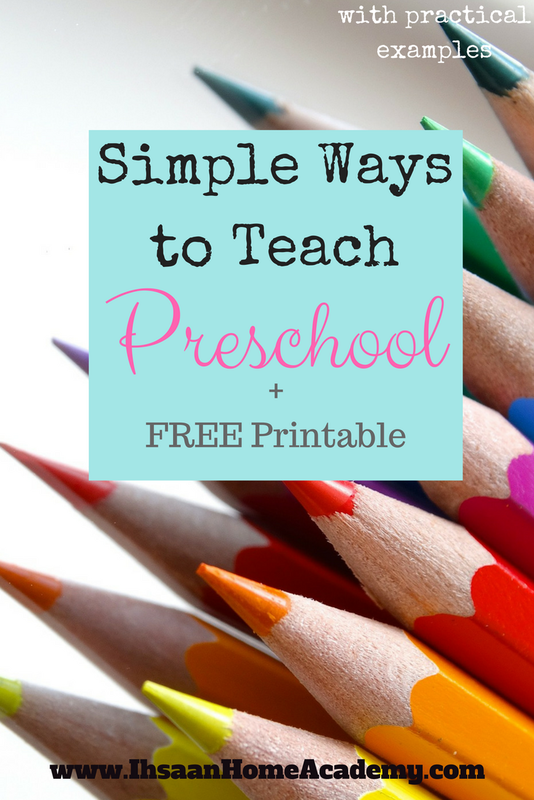 I piled a number of preschool resources and printables here. 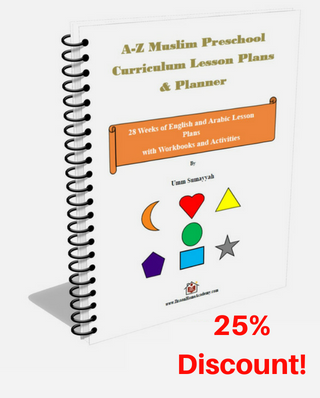 I also have a complete Preschool-Kindergarten curriculum for Muslim kids. 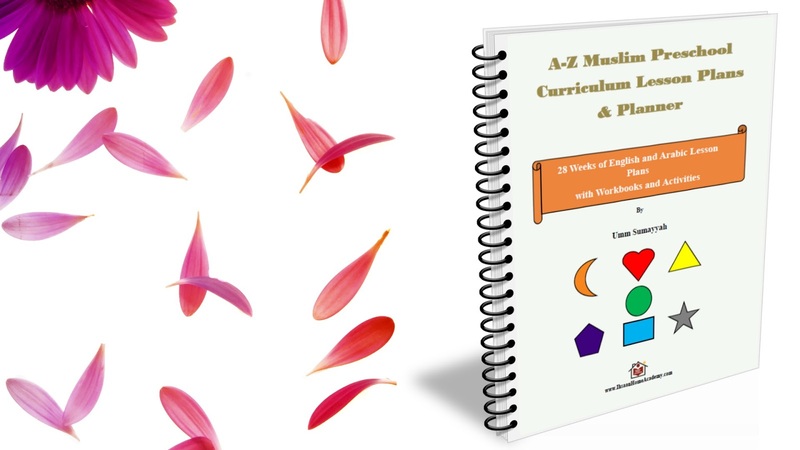 It comes with English and Arabic activity books and lots of extra activities. I made it for my daughter and to share with others who may prefer having everything in one box instead of printing different sheets from different places. I'm more productive with my daughter when I know exactly what I want to do; well, sort of. I need to at least have an idea from the beginning even if I later venture off a bit. But, you can totally do without any of that. keep it simple, fun, and creative! Now that was a bit personal. I don't usually talk much about my personal life or experiences in detail, but I thought this post may help someone out there. I'm not an expert, so just read this article as just someone else's experience that you may be able to take tips from. Most importantly, please, do NOT compare your children to other children. Every child is different and learns in his/her own way. Do NOT pressure your children while trying to catch up with other children. Doing so would be harming them. Instead, find the balance by being very attentive to how they learn and what makes them happy. Encourage, complement, and let them explore. Feel free to ask if you have any questions.